Not in the mood?! Mood is for cattle and love play! Recently I have not been in the mood for, well to be honest, anything. I have been miserable, and felt like crawling into a hole to hide. I have been exhausted and I have been on the edge of tears all the time. The slightest things have stressed me out and I can only guess I haven’t been the most fun person to be around. It all came to a head when I was in the shower about 2 weeks ago, I started crying, not just a little bit, but almost hysterical sobbing, for no reason. I cannot tell you why I was wailing like a baby, or what triggered it, I just couldn’t stop. I even woke my daughter up, and made my husband think I’d had some kind of accident. It freaked me out, I’d never really felt like that before, and never really felt so out of control of my emotions. Don’t misunderstand me, I’m not pretending I’m some “green blooded hobgoblin” who is always able to keep emotional responses under a Vulcan eyebrow lift, but I truly couldn’t stop crying and I honestly can’t tell you what for. What do you want me to do about it?! To which I was quite taken aback and unsure how to answer, I wasn’t aware I was supposed to have done homework before coming to the surgery. I found it hard enough to book the appointment, and explain to the doctor how I felt, I was also supposed to have looked for a solution? That’s why I went to the doctor, I though she might have some answers and help. I did explain I’d no idea what the options were, and was open to her suggestions and she replied. Well, it sounds like your depressed, we could prescribe some medication or we could do some blood tests to see if its something else? I have a reluctance to take medication willy nilly, if it’s not what I need at that moment in time, why take it? What if I build up a resistance? And it’s not as strong as when I REALLY need it? So I asked for a blood test and with that I was literally dismissed from the doctors office, as if I had wasted her time. I left the doctors feeling quite upset, but mostly angry! I might be wrong, and I’ve only been told things about Post Natal Depression, but all the things the Midwives & Heath Visitors have said were quite supportive and I just assumed that my doctor would be on the same wavelength when I came to someone without the “Post Natal” part of the equation. Now I know things on the Internet should be take with a pinch of salt, but the NHS website was quite useful, and I wish I just did some googling and never darkened the door of my doctors surgery. I’m still waiting for the blood test results and it’s possible that there is something else under this miserable mood and exhaustion. But in the mean time I’m literally forcing myself to do some kind of exercise on a daily basis, mostly walking home from work (about 2km) and pushing to have as much routine as you can working in retail and being a mum of two under 5 year olds, and trying to eat more veggies & fruit. I’ve also invested in some retail therapy, and bought some of these. 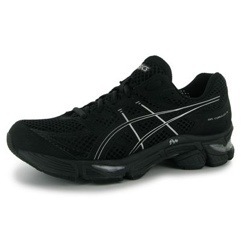 They’re Asics and they’ve got Gel in them, that’s about all I remember without checking the box! I’ll let you know more once I’ve actually been out and ran in them. So there we go! I’ve dumped a load of non running woes in my running blog and hopefully you’re still reading. I guess I’ll let you know how the blood test goes. oh P.S happy Pancake Day!